Get swept away in the last three Scandalous Seasons novels! 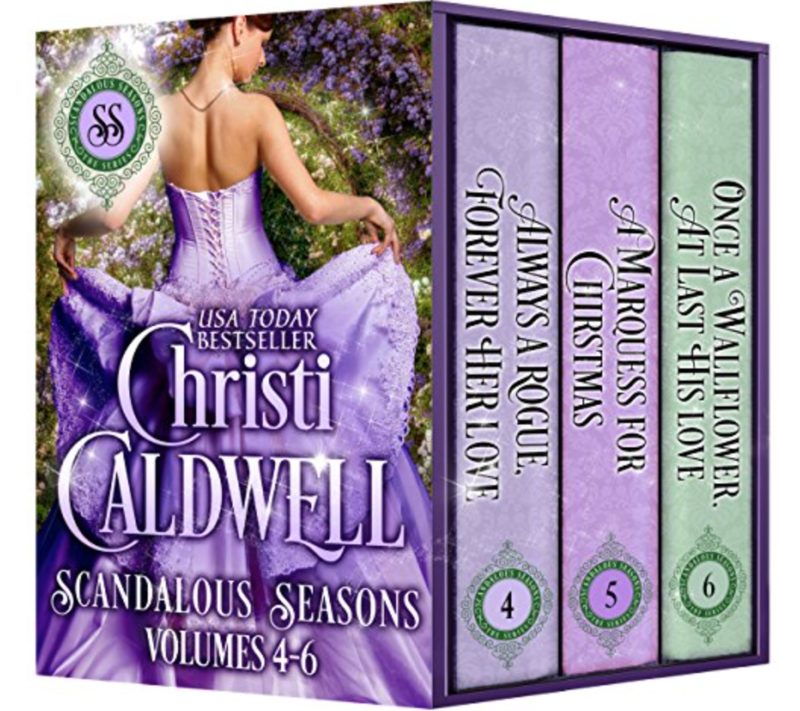 Get swept away in the last three installments of the Scandalous Seasons series! These previous released, bestselling tales of rogues, wallflowers, and the enduring power of love are now available in this limited edition box-set! When the roguish Earl of Sinclair wins Miss Juliet Marshville’s family cottage in a game of cards to her brother, Juliet takes matters into her own hands. She’s offered first the position of governess to his wayward sisters…and then mistress for the man known as Sin. But Juliet will settle for nothing less than marriage. Can she tame a hopeless rogue? Lady Patrina Tidemore gave up on the notion of true love after having her heart shattered. She finds peace in the cold winter days at Hyde Park—until two little hellions shatter it. Two hellions who happen to have a devastatingly handsome, but coldly aloof father, the Marquess of Beaufort. At the Christmastide season, Patrina and Weston, unexpectedly learn true love in one another. As Patrina’s scandalous past threatens their future and the happiness of his children, they are both left to determine if love is enough. Miss Hermione Rogers has been crafting stories as the notorious Mr. Michael Michaelmas and selling them for a meager wage to support her siblings. In London for her first Season she seizes the chance to write the tale of a duke. In her research, she finds Sebastian Fitzhugh, the 5th Duke of Mallen. The Duke of Mallen has been deceived so many times during the high-stakes game of courtship, he’s lost faith in society women. He’d like to trust Hermione, he’d like to do a whole lot more with her too, but should he?